I’d like to introduce you to a few special Congolese children whom I’ve fallen in love with: Bwazu, age 12, and Grace, age 3. Both are sponsored by EFCA GlobalFingerprints and are loved by their caregivers.1 Both face daily challenges difficult for many of us to comprehend. Both seem already to know and trust their Creator Father. 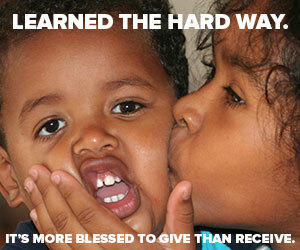 And both have medical needs that go beyond our ability to meet through the $35/month from their sponsors. Let me start with Grace. She was thus named because, despite the shocking details of her birth and rejection by her mom, God’s grace has overflowed in her life. Grace was found about three years ago in an outhouse hole a few miles from Tandala Hospital.2 Someone heard a faint whimper and thought it was a little goat. But a flashlight revealed a newborn, lying in human waste, covered with insect bites. “Who can be compared with God enthroned on high? Far below Him are the heavens and the earth; He stoops to look, and lifts the poor from the dirt and the hungry from the garbage dump, and sets them among princes! He gives children to the childless wife, so that she becomes a happy mother. Hallelujah!” (Psalm 113:5-9, Living Bible). Grace, at age 2, with her adoptive mother, Mama Kossa. Bwazu and his mother (photo at top) looking forward to his cataract surgery. And so Grace became our princess. Our hospital accountant, Mama Kossa, had never given birth after more than 15 years of marriage, and she longed for a baby. She took one look at Grace, covered with dirt and bites, and never left her side. She and her husband wanted Grace as their own. We don’t know if there was damage at birth or when Grace was thrown away, but she has little muscle control and is especially weak on her left side. She can neither sit up by herself nor walk. Her mom and “sister cousins” help her with exercises to strengthen her muscle tone. Grace also had an eye surgically removed not long after birth. Just this fall she had an eye prosthesis specially made for her. Grace after receiving her new eye. Bwazu is from Libenge, a village quite far from Tandala Hospital. His father died years ago and he lives with his mother, who has little source of income. Tragically, Bwazu had gone blind due to cataracts. In Congo, to be blind is almost a death sentence, due to the uneven ground, with rocks and holes everywhere. Often, children sit at home day and night with nothing to do, because they cannot attend school. Such was the case for Bwazu. We can’t remove serious, congenital cataracts at Tandala Hospital, so Bwazu and his mother traveled by plane with Grace and her mother to the eye hospital in Kinshasa, Congo’s capital. Often, if the delay is too long, congenital cataracts cannot be removed at all. But Bwazu’s surgery was successful, and he can now see. However, he struggles with a condition called nystagmus, often called “dancing eyes,” so he still needs prayer. Grace’s procedure to fit her with a prosthetic eye was successful as well. After physical therapy in Kinshasa, she and her mother will return home. Babies whose moms die at birth need milk formula. Costs for one such child can reach $25/month, and we currently have five babies like this in our program. Some children need a special wheelchair because of polio or other diseases. Each chair ($270) is built just for that child by one of our Congolese staff, because regular wheelchairs don’t work on Congo paths. These chairs provide dignity and independence. Last month, three chairs were completed for GlobalFingerprints kids: Lezose, Heritier and Minos. Children frequently need surgery for hernias, for burns incurred from falling in fires (which is frequent with epileptic children) and for broken bones from accidents. Malnutrition is common, and our kids need extra, expensive protein. Sending children to Kinshasa for medical care is not cheap. We are grateful for the GlobalFingerprints Emergency Fund, which helps cover travel and medical care. What joy to see God restore these little ones to become true princes and princesses among us. 1GlobalFingerprints children in Congo are all orphans (the loss of father, mother or both). The country has hundreds of thousands of such orphans, and GlobalFingerprints employs seven criteria for choosing who will be sponsored: educational, shelter, nutritional, psychosocial, spiritual, medical and protection needs. We keep children in family settings, in their villages, and help provide for their needs. All attend school and receive medical care. All are involved in nutritional projects that also help their families. All learn God’s Word, are prayed with, and are invited to Bible camp and retreats. All of our staff members attend one of the 900 local Evangelical Free Churches in Congo. 2Tandala Hospital, built in 1955 by EFCA missionaries, is now run by the Evangelical Free Church of Congo. It’s one of the largest hospitals serving the northwest region of Democratic Republic of Congo, offering specialized care in ophthalmology, dentistry and radiology. Tandala is heavily dependent on donations from Evangelical Free Churches, as well as from individuals and a few other organizations. Stay in touch via Facebook. Travel and medical care for Grace and Bwazu surpassed $2,000 each. To help cover costs for them and other sponsored children like them, please give to the EFCA GlobalFingerprints emergency fund. To learn how to sponsor a child, visit the GlobalFingerprints site.